Network-ready and wireless features make the Oki B731dnw a versatile single function printer for small and busy workgroups. The Oki B731dnw A4 mono workgroup printer is designed to be cost-effective and efficient for the business, with easily upgradeable components that meet the growing needs of users, but the high initial price of the B731dnw printer and its lack of some important functions can affect its overall efficiency in any type of workplace. The industrial design of the Oki B731dnw laser printer shows its durability and simplicity. It delivers reliable performance as it is powered by an 800MHz processor while running on 256MB of RAM. The understated 27Kg frame measures 410 x 435 x 498mm, so it needs more installation space. Connectivity options include both wired and wireless LAN, plus two USB 2.0 ports. The standard paper capacity of the Oki B731dnw mono LED printer is 530 sheets, plus 100 sheets for the multipurpose tray. The control panel is small but features one-touch operational buttons, navigation keys, and a backlit display screen. Security features help prevent unauthorised usage while protecting sensitive data. This model has versatile emulations and connectivity features, and the warranty can be extended to three years to give your Oki B731dnw the best possible chance to remain in active use. The memory can be upgraded to 768MB, and the paper capacity can be increased with optional trays. Up to 30 users may share the Oki B-731dnw monochrome printer. A huge capacity of approximately 36,000 pages ensures that the high capacity Oki B731dnw toner cartridge can deliver a very low cost-per-print. 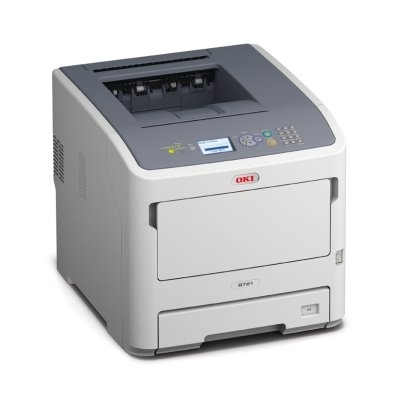 The Oki B731dnw can be expensive to upgrade for additional memory and paper capacity. The 160GB hard disk drive is optional. Noise can be problematic. The B731dnw LED printer is heavy, so it can be difficult to transport and set up.